Whenever the snow is blustering outside and winter seems to be showing its bad side, nothing seems more comforting than a few extra hours spent in bed on a Saturday. Sadly, when it’s mid-week and braving Old Man Winter is your only option, a simmering pot of something on the stove could very well be your next best friend. A generous helping of chili con carne (taken from Spanish means “with meat”) has been a lifesaver when I’ve been short on time and needed a pick-me-up. It doesn’t need a babysitter and the longer these ingredients stay in the tub, the better. I like my chili with a bit of a kick, but feel free to add less or more spice according to your own tastes. You can also throw in your favourite chili peppers for extra bite. So, if you’re in the mood for more spicy meal ideas to chase away those winter blues, you’re in luck! Over medium-high heat, soften the onions in the olive oil for about 1-2 minutes in a dutch oven or medium-sized stock pot. Add the ground beef and cook until all of the meat is almost completely browned. Add the bell pepper and white mushrooms. Cook for another 2-3 minutes. Stir in the finely chopped garlic and then, pour in the crushed or diced tomatoes (enough so that 3/4 of the meat and other ingredients are covered, but not so much that the chili appears watery) and kidney beans. Feel free to use homemade crushed tomatoes if they are in season. Add the cumin, paprika, nutmeg, cayenne pepper (or chili powder). Allow the chili to simmer uncovered (stirring occasionally) for 10-15 minutes until it appears thick and/or at least 1/4 of the liquid has reduced. Season with salt and pepper and then, add the cilantro (if desired) at the last minute. Serves 4-6. If you’d like to serve the chili with rice, get the rice started before tackling the chili. If you’re using a rice cooker, pour the rice (yields 2-3 portions) into the rice cooker bowl and fill it with water to the 1 cup line. When placing a hand on top of the rice, water should partially cover the top of your hand. Turn on the rice cooker and cook rice according to the manufacturer’s instructions. Once cooked, serve the rice with the chili. For a healthier alternative, go ahead and use brown, long-grain rice. It will have a chewier texture than white rice and does take longer to cook because the bran is left intact. Go ahead and substitute the rice for bread, flatbread, or a side of crispy homemade potato wedges. The chili can also easily be vegan- or vegetarian-friendly by simply omitting the ground beef. If you’re looking for a way to reinvent your leftover chili, use it in a fajita! Add some fresh lettuce, diced tomato, sharp cheddar cheese, and your favourite fixings. Then, wrap everything up in a tortilla and dinner is served! 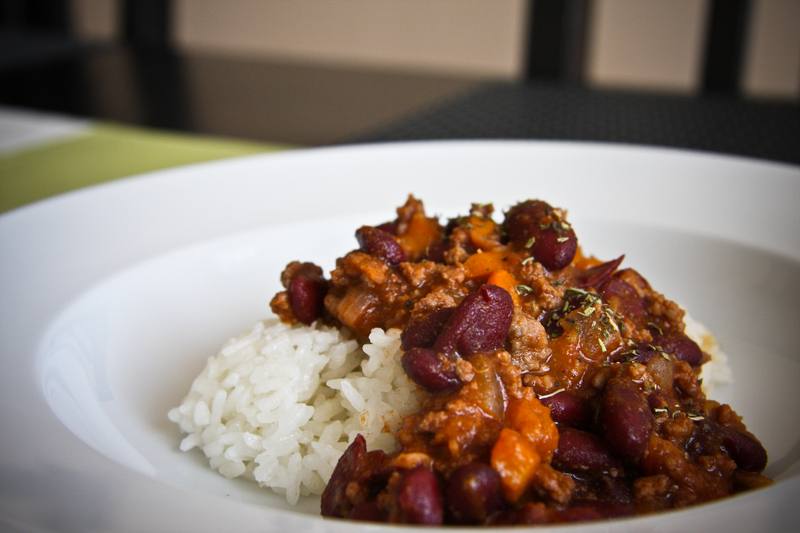 This entry was posted in Mains and tagged chili, chili con carne, chili on rice, comfort food, easy chili. Bookmark the permalink.